Live music at Artfest Toronto is a lovely experience. Listen to tunes while you stroll around the show. 12pm-6pm Daily. 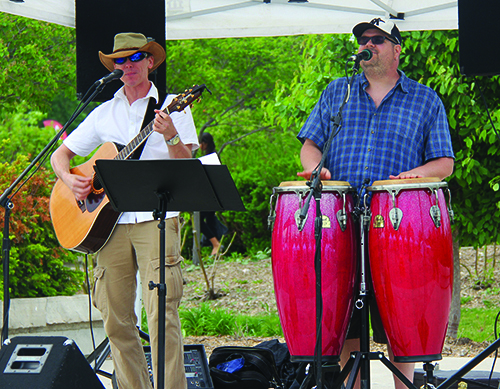 Artfest presents performances by wonderful musicians to enhance the great atmosphere for visitors. We keep the music low-key so it doesn’t overpower the art scene, but engaging to make your time with us very enjoyable. Andy is a energetic and passionate rootsy folkin' rock singer/songwriter who writes from gut feelings and personal experiences. He sings lead and plays a driving rhythmic/percussive style on acoustic guitar. Catchy melodies and tight vocal harmonies are prevalent throughout his tunes. For the last 30 some odd years he's also been pursuing his love of music ... writing and recording original music whenever he was able to. Mostly original shows, feature sets, and open stages. Which lead Andy to record and release his debut album Looking At Life in 2011. Along with help from many of the incredible musicians he met along the way. This album is a folky-rock album with an honest take on a life well lived. Reviewers have written that Andy's music brings comparison to Tom Petty, Bob Dylan, The Lowest of the Low, John Mellencamp, John Hiatt, Grapes of Wrath amongst others. Other album releases are Mind on Other Things and Stella Started It! Matt - born into a musical family - started playing guitar when he was 12 and has been playing professionally since the age of 14. He has performed and/or recorded with Scarefactory, Barney Rebel, Midnight Radio, The Funk King Band, Gonzo, Kevin MacLean, Astrid Young, Harrison Kennedy. (appearing on the Juno-nominated "Shame The Devil") Over the last few years he has taken on the role of solo acoustic guitarist/vocalist, plays in The Duo with Scott Apted and is a sideman for a number of local artists in the greater southern Ontario area. The name of our group is called “Farrucas Duo”. We are a husband-and-wife duo that experiments with the diversity of Latin sounds and instruments through our music; painting an exotic musical portrait for you to enjoy all year long. On the Sunday Melody Fair joins us with beautiful guitar rhythms and sweet melodies. David Wipper has a solid background in recording and concert performance. You will recognize his distinctive style from Grammy Award winning hit song Black Velvet and other hits by Amanda Marshall, Rita Coolidge and Return Trip. Hazel Wipper hails from folk band Jesse and later the Decades and sings gorgeous lead with her partner David in Melody Fair. They perform a wide range of folk and rock classics showcasing David’s stellar guitar skills and Hazel’s amazing voice. Fergus Hambleton is a versatile singer, songwriter, composer and multi-instrumentalist. During his lengthy career Fergus has been a leading performer and songwriter in the folk, pop and reggae fields. Starting in the 1960s Fergus began playing music in a variety of bands and orchestras. The rock scene in Toronto was hot and Fergus played in a number of local bands,including A Passing Fancy, one of the more popular Yorkville bands. After a bit of travel Fergus signed a deal with Capitol Canada and released two albums in a folk rock style, produced by his brother Greg Hambleton. He has performed with many groups including the Leroy Sibbles band and The Sattalites and is heads the Jazz Lovers Society ensemble. A Juno award winning musician, multi talented singer, songwriter Fergus Hamilton will be joined by founding member of the legendary Moby Grape.